Priska Zemp was born with a musical talent. Her mother is a classically trained soprano, her father sings in several choirs. Also her sister and brothers are busy in bands. During the last ten years Priska Zemp has gathered experience as a singer and composer in different bands. It more and more became the number one thing in her life. In April 2005 she started her solo career as Heidi Happy. Just two years later she has hit her peak. 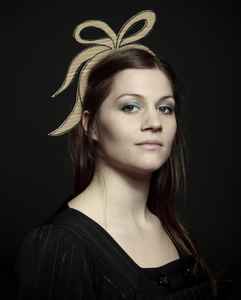 By the end of 2006 she won a reward (Werkbeitrag) from the city and kanton of lucerne, switzerland, wherewith she produced her first album „back together“ on little jig records / irascible distribution. Everything that Heidi sings has past her heart a million times. It’s all stories, that make her sad or happy, that made her sceam, cry or even puke. While she’s singing these stories, one has the feeling that her heart might soon fall out her mouth. No matter if you start being tired of all these singer- songwriters, or if you think the turquoise of her guitar doesn’t match with her shirt; the songs, her voice, the combination of beautiful melodies and unscrupulously personal lyrics make your heart dance in a different world.